David Cameron: "Your Decision. Not Politicians. Not Parliament. Just You"
"If we vote to leave, we will leave. There'll not be another renegotiation or another referendum"
* Staying in parts of the EU means the same as leaving the EU. All specious garbage. All deceits. All part of the plan to wear the Leave vote down. All part of the pro-EU political establishment determination to stop us leaving. The simple truth is that we never voted for 'a deal'. It is a matter of fact that 'a deal' was not on the 2016 Ballot paper" [source]. "Both major parties promised to leave the single market and the Customs Union. All of the options being presented, including the PM's deal, lead to this commitment being overturned and a Brexit Betrayal. Leaving without a deal is now by far the best option. This would free us to make our own laws, free us from paying money and lower the cost of living by removing tariffs. Combined with making trade deals and taking back farming and fisheries our economy will boost as a result. it is time to leave with No Deal and deliver the will of the people." 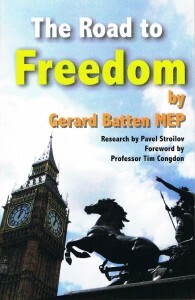 "The correct clause [in the Vienna Convention on the Law of Treaty Making 1969] states that no trading agreement may be entered into which significantly compromises the constitutional integrity of the responding nation ... we must begin to educate the public and electorate as to the relative risks of both a Remain strategy and the reasons why a No Deal exit may be the only means to preserve our national independence and our continuity of our proud sovereign status..."
"How to end the Brexit betrayal so the UK leaves the EU now: After the PM succeeded in delaying Brexit in Parliament on Wednesday, it has become blatantly obvious that the British public are being grotesquely betrayed on their vote to Leave the EU. Remainers have been running the government ... A couple of years ago, those who argued that the remainers could actually stop Brexit were largely treated with scepticism. Those who warned that Theresa May could not be relied upon were treated with disbelief. Yet the soothsayers were right. There was a plan of betrayal from the moment the referendum was won. All resources, all tactics, every argument, was used to delay and hamper Brexit..."
"One of the most respected figures in British economics has made a last-minute appeal for Brexit sanity, pointing the way forward to a managed no-deal full Brexit while dismissing politicians suffering from collective 'nervous breakdown' and project fear claims that do not reflect reality. Speaking this morning, just hours before the legal deadline that the British PM repeatedly promised would be the moment the UK left the EU before changing her mind at the last minute, former governor of the Bank of England Mervyn King has called for a full Brexit and for politicians to reject Theresa May's WA..."
"Jean-Marc Puissesseau told Sky News that Calais has been planning for a customs border between his EU port and Brexit Britain for over a year, introducing new customs processes including internet-based customs declarations and a revamped area for the small percentage of lorries that will need to park ad be checked. 'We have been planning for a no-deal Brexit for more than a year so we have been improving the flow of traffic. We started the building work ion January with a deadline of having it done by 29 March', Mr Puissesseau said..."
"A package of agreements and legislation is now in place which means that an exit from the EU on 29 March 2019 - as promised - can be properly called a 'WTO Brexit' ... It's a deal in the best sense of the word - a collection of arrangements of mutual benefit that guarantee continuity for businesses and individuals. It seems that most MPs haven't even bothered to take note of the masses of no-deal Breixit legislation that has already been passed by Parliament to ensure there is no 'cliff-edge' on 29 March 2019..."
"There are undoubtedly many Remainers in the establishment who are determined to stop Brexit outright. Others are trying to create a fiction of Brexit that in reality keeps the UK in the EU in all but name. Many Brexiteers would like to see the UK leave without a deal, on WTO terms - a clean Brexit. After all, this is what was on the referendum ballot paper: it said Leave, it said nothing about a deal and David Cameron was explicit that there would be no further deals beyond his. However, there are those in both camps who are prepared to countenance some sort of deal that would smooth the UK's exit from the EU..."
"Summing up the HoC debate over the WA on Tuesday, UK PM Theresa May began by declaring that this was a debate 'about the economy'. This pushed one of the enduring myths about Brexit: that it is primarily a matter of economics. 'Economics' has been used throughout the Brexit discussion to evade the fundamental political significance of what is going on ... Brexit is a matter of supreme political import. Initially, until the referendum vote, the discussion was primarily about national sovereignty ... Leaving without a formal WA does not mean 'crashing out' or 'jumping off a cliff', or any of the other pejorative phrases about the possible economic consequences. All leaving means, economically speaking, is that Britain will no longer be trading with, and its businesses connecting with, other EU countries on the terms set by the rules of the EU Single Market and Customs Unions. This was always going to be the consequence of implementing the Brexit vote. Government and businesses, as well as individuals, could and should have been preparing for that change ever since 24 June 2016. If, in places, this has not happened yet, that cannot be blamed on the Leave vote itself..."
"A senior civil servant has blown the whistle on 'Project Fear Mark III', revealing that the country is actually well-prepared for a 'No Deal' Brexit and scare stories about Britain 'crashing out' into 'chaos and doom' are 'absolutely untrue'. The anonymous official, who has been working on Britain's preparations for a Brexit on WTO terms - the so-called 'No Deal' scenario - revealed ... that there are 'hundreds' of plans in place to ensure that outlandish threats of food, water, and medicine shortages will not be realised, and that 'it is purely a political decision not to make this clear to the public...'"
"The political establishment is doing everything it can to scupper Brexit and the British people are being bombarded with anti-Brexit propaganda daily. To add insult to injury we have a PM who prostrates herself at every opportunity in front of other world leaders. The solution to this mess and to deliver on the referendum decision is to repeal the 1972 ECA and get Britain out and trading on WTO terms at the earliest opportunity"
of the EU is unlawful"
"In their annoyance at the people for rejecting their beloved EU, yesterday's men claimed that the people had been bamboozled by lies, Russian propaganda and their stupidity in not understanding the huge benefits of the EU. Particularly to our establishment. Their real concern was that their own lies and manufactured fears were rejected by the people after forty years' experience of the rambling shambles that is the EU. Defeated, they've now launched an even bigger programme of lies to but the people back in their box and con them to stay in it and the EU. They're top grade lies ... Here [they are]:..."
"[T]his government has handled Brexit in ways that would make Messrs Pitt, Castlereagh, Palmerstone, et al spin like tops in their graves. Sometimes they acted as true statesmen, sometimes they didn't, but they never went to Europe as supplicants, begging for 'deals' ... imploring chaps from Luxembourg and Poland to let our own parliament pass more of our own laws ... one thing a self-respecting country can never relinquish is its sovereignty ... British sovereignty is vested in parliament, and no fragment of it can be broken off and traded away ... Any courageous statesmanlike PM would be telling the EU what we're going to do, not asking if we could please do it..."
"Theresa May has claimed that the Withdrawal Agreement achieves Brexit by the UK 'taking back control of its trade, borders and laws.' This is one of the most patently false spins in modern political history. We don't even regain control of our fish. The agreement involves the UK staying in the EU customs union until December 2020, entitled to negotiate trade deals with other countries but completely unable to implement them, and with UK parliament and courts remaining subordinate to EU laws and the CJEU. So, until 2021, far from regaining control of our trade and laws we become a rule taker - and pay an eye-watering £39 billion for the privilege..."
"Theresa May presented her Draft Withdrawal Agreement on Brexit. May claimed that it delivered the Brexit that 17.4m people voted for. Yet, this is no 'strong and stable' Brexit Deal. It is a wholesale betrayal of the biggest democratic vote in our history. It leaves us wedded to the Customs Union for years, if not indefinitely ... it ties us into the Single Market ... we cannot control immigration or strike free trade deals ... We will be a vassal state having no say over laws that govern us ... the CJEU shall have jurisdiction ... We would be better off by leaving without a deal ... Theresa May is the worst PM in living memory. She is consigning her country to a state of political paralysis, locked in the orbit of the EU..."
"There is much written about Brexit manoeuvres at the moment. Will the Protestants defeat the Romans in the long run? ... It would be a darn sight easier if the Brexit-leaning Cabinet 'rump' ... were to master the economics of free trade. To give them a helping hand, here is another guide to what a World Trade Deal means. They'll find it is nothing to fear. The supply of Mr Kipling cakes and Mars Bars will not dry up..."
"The following quotation from a 1947 pamphlet entitled ' Design for Europe' by Peter Thorneycroft ... has long stuck in my mind: 'No government dependent on a democratic vote could possible agree in advance to the sacrifice that any adequate plan must involve. The British people must be led slowly and unconsciously into the abandonment of their traditional economic defences'..."
"WTO is the forward-looking global trading option. It is not about falling off cliffs as the Treasury's Project Fear would have us believe. Jacob Rees-Mogg reiterated this on Thursday at his impromptu press conference: 'We trade with other countries on WTO rules - we do not need to trade on anything other than WTO rules...' It will result in lower commodity prices and benefit the poorest..."
"We have already made it clear ... that we believe the wisest and most honest way forward from the near-catastrophic mess Mrs May has landed the country in, is to repudiate her so-called deal and leave the EU (all of it, the customs union, the single market, and the jurisdiction of the European Court of Justice) as intended on 29 March 2019, on No-Deal, WTO terms ... Irrational fear is all that stands in the way of Britain restoring its sovereignty and reclaiming control of its borders..."
"For more months than I care to remember, Theresa May has droned on about 'a good deal for Britain' as if leaving the EU without a deal was a 'bad' deal. Our membership of the EU has been a rotten trade deal from day one. And here's precisely why. The single market was always trumpeted as a 'free market' (so much so that even Margaret Thatcher was deceived by this) which, of course, it is not..."
"As Nigel Farage pointed out on QT on 8 December, the UK could leave the EU in two weeks. It is neither a complex nor a difficult thing to do. As he said, we simply tell them we are out, and offer a free trade deal. ... it should have happened on 24 June ... Why is it not being done? There are two parts to the answer, which might conveniently be called respectively 'Whitehall' and 'Westminster'..."
"PM Theresa May will promise to make Britain 'a sovereign and independent country' by repealing the act that took it into what is now the EU next year, ... 'We will introduce, in the next Queen's speech, a Great Repeal Bill that will remove the European Communities Act from the statute book' ... The British leader is expected to trigger Article 50 to start formal departure, which can take up to two years to negotiate, early next year, but she has been clear she does not want to give her hand away before the talks..."
"Most people want a speedy move. Those who want out do not wish to wait for long until the result of their vote is achieved. We need to move in a purposeful and friendly way to achieve an early settlement which deals with the worries and fears of those who voted Remain. The aim should be to secure the main point of the campaign, taking back control, as soon as possible. We will only have achieved this aim when we have repealed the European Communities Act..."
"There does seem to be some serious confusion about Vienna, Article 50 and the ECA. This is really a subject for experts - non-expert frankly, seem almost inevitably to fall into the trap of confusing international and domestic law, miring themselves in utter confusion in the process. re-stating what I have been emphasising for over 20 years:..."
"Many constitutional experts believe that Britain isn't actually a member of the EU since our apparent entry was in violation of British law and was, therefore, invalid. 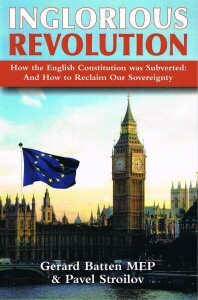 In enacting the European Communities Bill through an ordinary vote in the HofC, Ted Heath's Government breached the constitutional convention which requires a prior consultation of the people (either by a general election or a referendum) on any measure involving constitutional change..."
"The European Communities Act 1972 was passed through Parliament in order to allow the UK to join [the EEC], and two of its key provisions gave effect within the UK to the so-called 'direct effect' of Community law, and the doctrine that that law has primacy over other laws..."
Lord Pearson's speech to the House of Lords. Viewers' comments: "Well said Lord Pearson. The voice of reason in that treasonous den of snakes" / "Thank you Lord Pearson. A lord to be respected. Maybe the only one, rare indeed" / Lord Pearson must feel constantly that he is in enemy territory, an intelligent man in an archaic chamber of low IQ ... political traitors" / "Gerard Batten and Lord Pearson. Two voices of reason amongst a sea of self serving shysters" / "Finally a lord that actually understands how the people think!" / "Representing the people - unheard of in that building" / Lord Pearson, what a great man" / "One true voice in a chamber of sociopaths" / "A politician calling out the BBC, wow I sense truth and integrity, a very rare thing indeed coming out of that place" / "Lord Pearson speaks for me" / "Lord Pearson is a national hero" / "This man is wise and truthful"
"If we vote to leave, we will leave. There'll not be another renegotiation or another referendum" / Viewers' comments: "But we didn't know what we were voting for apparently! This should be played every 15 minutes in parliament" / "'This will be an In or Out referendum' (That is, if you vote to remain. Vote to leave and we will do everything in our power to nullify the vote)" / "Sounds like Mrs May didn't get the memo" / "Once upon a time it was Parliament against the Monarchy, now who is going to protect the people from parliament?" / "The word TREASON exists for a reason" / "'An in or out referendum'. He lost his way - he should have been a comedian" / "When I voted to leave, what I really meant was... Give them 39 billion and agree to the next round of the 7 year spending, agree to the new rules proposed by the commission and accept the ECJ rulings. Isn't democracy fun?" / "Of course, they never thought we'd dare to be so uppity and vote to leave their precious EU. It didn't take long for those promises to get thrown out the window" / "The time could be coming when its Roundheads vs Cavaliers again, but this time it will be Leavers and Remoaners" / "You see, remainers. Once in a generation choice. Now respect democracy. WTO now" / "They never meant it. Amusing that this was meant to make us vote Remain at the time" / "A lying politician... well what a shock"
"We call upon our MPs to repeal the 1972 European Communities Act immediately should the EU Referendum result in a Leave majority vote, thus making membership of the EU null and void, without any further interference from the government or the EU." "To the best of my knowledge no democratic country has ever voluntarily agreed to a treaty in which it agrees that a foreign power may, if it so wishes, overrule that country's laws forever. In a week following the centenary remembrance of the WWI armistice, the UK government has agreed a deal arguable worse for the UK than the Treaty of Versailles was a hundred years ago for Germany ... It was always naive to hope that somebody who campaigned against democracy could be trusted to respect the referendum result. Thanks to Theresa May a strong hand has been deliberately misplayed, taxpayers' money wantonly thrown away, divisions deepened and a precious two and three quarter years to prepare for the future squandered. No doubt the pain and trauma of no deal will be the greater as a result of her Brexit betrayal. There will be more drama ahead in what May has made into an all or nothing game of chicken. True democrats of any party however now have no choice. We must all prepare to crash out of the EU gaol come what may" [source]. "Time wouldn't be running short if we hadn't wasted two years on Oliver Twist-like supplicancy, begging our European masters to be kind, whereas all they want is to punish us, discourage others and, ideally, torpedo Brexit. A PM committed to Brexit, rather than to the warped ruling elite, could have invoked the Royal Prerogative, left immediately after Parliament activated Article 50 - and only then started negotiating 'deals'." [source]. "I don't think this was an instruction not to pray, but rather to not talk against Moses and what God had done. "The way forward may seem unclear to us, but we know for sure, God can direct our paths if we seek His direction. Whatever people say and do in the coming days, let us pray for God's direction and for His decision to stand"
"Parliament voted to put the decision about our membership of the EU in the hands of the British people. and to carry out their instruction in full. MPs and peers who regret the referendum result need to accept what the people decided"